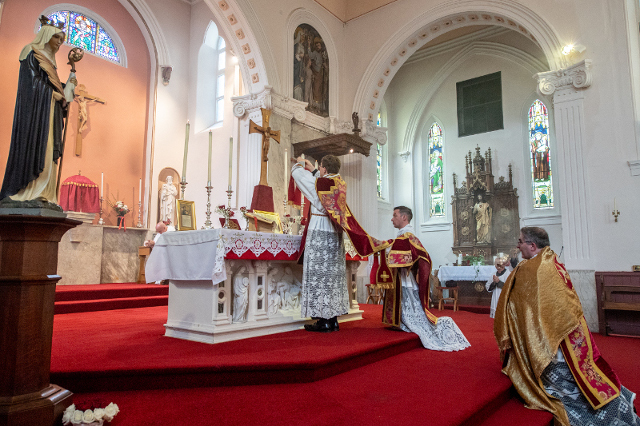 The Latin Mass Society's annual Pilgrimage to Holywell, in association with the ICKSP, will take place on Sunday, 7th July. High Mass in the parish church at 2.30pm followed by a rosary procession to St Winefride's Well where the relic of St Winefride is presented for veneration. All welcome! Music will be provided by the Schola Gregoriana Malverniensis. Picture: The Elevation of the Sacred Host during our pilgrimage in 2018. © John Aron.